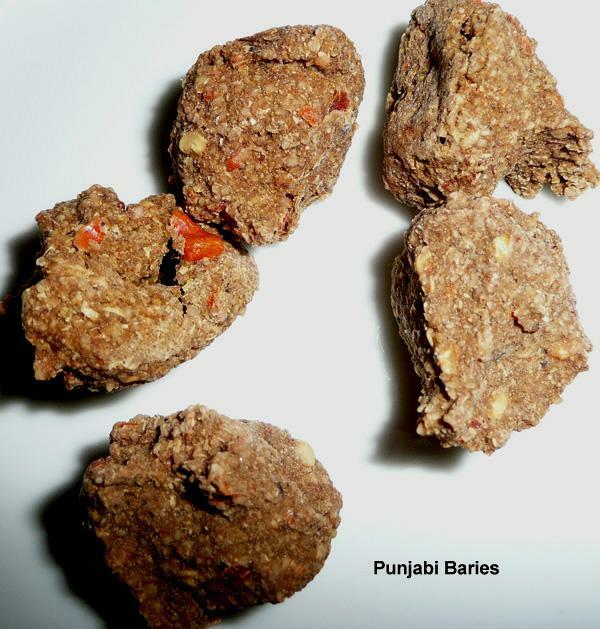 Note from Mamta: Baries are very spicy, dry dumplings, used in many Indian dishes. They should be made in summer months as they need hot sun to dry quickly. If you live in a cold country, a conservatory or a window sill during summer months is ideal for this purpose. Living in UK, I have only attempted to make them once, not with much success. Mrs. Lal brings them for me from India every year, from her fresh stock. They are usually made in bulk. You can buy them ready-made from most Indian grocers. Once dry, they can be stored in jars/boxes/plastic bags for use through the year, I keep mine in a plastic bag, in the freezer. This retains the freshness. Bari can also be spelled as Vadian/Vadi or Warian/Wari or Wadian/Wadi. Before cooking, you need to break them gently, by wrapping them in a kitchen towel and hitting them gently with a rolling pin or meat tenderizer. Then fry the pieces for a few seconds in 1 tsp. oil. They are now ready to be added to any dish of your choice. I often use them without frying. Adding 5-6 baries to a Potato curry or Khitchri or Khichri,� lifts� them up. They can also be added to various vegetable curries, meat dishes, rice pulaos etc., to give these dishes a distinctive spicy flavour. They can be soaked in water, mashed and used as stuffing for parathas, Kachori and Kasta Kachories. Makes approximately 700 gm. Coarsely grind urad dal in a coffee grinder. Soak in enough water to cover 1/2 inch above the dal and leave for a couple of hours. It will absorb water and become like a thick batter. Make a shallow well in the centre, by lifting out 1/2 a cup of the mix. Add asafoetida powder in the well and cover with the 1/2 cup of mix you had removed to make the well. Leave overnight in a warm place, to let it rise a little. Clean, wash and chop petha or cauliflower, grate and squeeze all water out. Keep aside. Grind ginger, green chillies and coriander leaves, all together, in a food processor. Measure all spices into the bowl with the dal. Mix all ingredients with the dal and beat vigorously. You may need to add a little water if it is too stiff. It needs to be of a stiff, dropping consistency. If you put a blob of this mix in a jug or glass of water, it should float to the surface due to trapped air. This trapped air is responsible for making the baries light. Spread a clean cloth on a clean surface, like a tray in the sun. This amount needs 2 trays. You can use trays lightly greased with oil. Place(drop) small blobs of about 1 inch diameter, like pakoras, onto the cloth. Leave them in the hot sun, until bone dry (very dry). Store in airtight containers or plastic bags. Freezer is good, if you have a large one.